I am one of those women who believe that mothers rule at home. The house is like a kingdom in which we legislate, negotiate, feed, clean, protect and educate (and I am not just talking about the kids here). From nurturing to keeping the peace and order, it seems there is no task a mom won’t be appointed. It is an excruciatingly difficult job at times and there are no sick days. 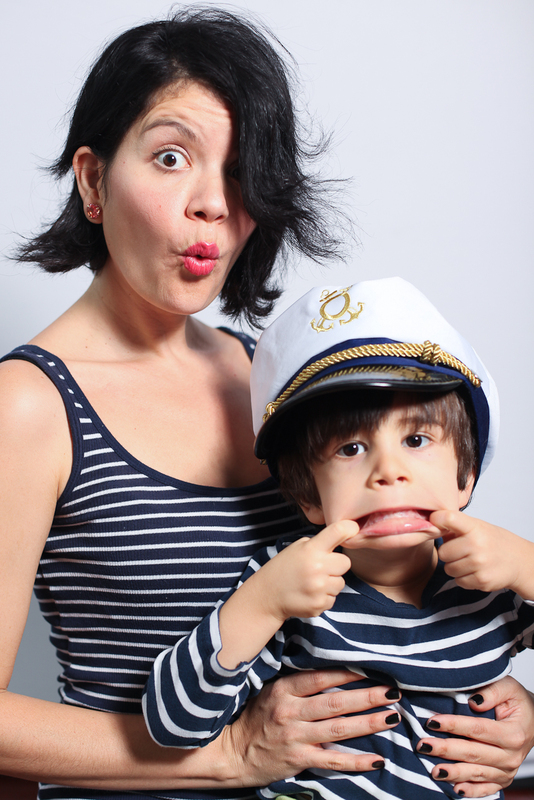 So when my son Lucas started calling me “Captain Mami” I felt it was only appropriate to enforce the title :). No, I did not teach him to call me that, he just did. Of course I know I am not in this alone, but honestly sometimes it feels that way. It is wonderful to be a mother. You get the chance to re-discover the world through the eyes of your children; to re-visit a state of innocence and charm only available for a limited time. It is filled with joy and love without compare. But like everything else there is a counterpart. Being a mom is also filled with poop, literally. Sleepless nights, defiance, fear, loneliness, boredom and despair are also part of the deal. It is the definition of yin-yang. Today for example I have endured a three-hour cry-a-thon efficiently carried out by Marcos, my two month old. That inspired Lucas to follow suit, then Lucas quit and passed the baton back to Marcos, who wins the gold today for overcoming all my attempts to make him stop. Needless to say my head is pounding like the conga solo inGloria Estefan’s hit single Conga. But if I have learned one thing this afternoon is to persevere. If those two little brats, and I say this lovingly, think they are going to take over my ship they are going to have to try a lot harder ( I want my kids to learn to always try their hardest:). I am responsible not only for my kids but for myself. So here is my point, you are in charge. You decide if you are going to lose your cool or if you are going to endure. Either way, regardless of what life throws at you, it is your choice how to react. This is not only the case for hard-working moms but for everyone. I know sometimes it might seem like it is too much, like when you think things can’t get worse, the baby starts crying. But believe me when I tell you, how you decide to live is up to you. Sometimes we need to cry, scream, throw our fists up in the air and ask dramatically: “Why?!!!!!”. Well you can sit there and wait for the answer, but the answer might never come and then you have overstayed you’re welcome to the pity party. Please don’t mistake my words for cruelty, I DO feel for you and your struggles. It is out of that place of compassion I tell you: “you are in charge, take charge and be happy”. Use your most powerful resources, whether it is family, friends, God or sheer will power. Being a mom is hard, but if you think I am wearing sweats and an oversize stained t-shirt as I write this, you are wrong ( though I have had those days:). Today I am wearing a lovely dress and I am having a good hair day:). Today Lucas told me he loves me, and that he can burp on the floor lol :). Today I finally got Marcos to stop crying only to witness the marvel he is. Today I decide that I will not go crazy. And I take comfort knowing that if I do go crazy tomorrow, I can take a deep breath and take charge later. After all, I AM Captain Mami and to be honest I LOVE it. ← To all the Captain Mami’s out there!